Daily Illuminator: What Table Is Large Enough To Hold Discworld? April 20, 2017: What Table Is Large Enough To Hold Discworld? 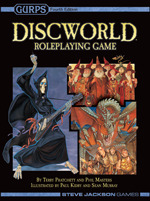 Have you seen the Discworld Roleplaying Game? Recently we've shown you sneak peeks at the Introduction, some setting material, and a few bits of game mechanics. When we're talking about the largest hardcover we've ever released, though, there's far more contained therein than can be revealed in even a meaty preview. So today we're looking at everything else, thanks to the Table of Contents. Peruse its three pages to get a sense of the 11-plus chapters of the Discworld Roleplaying Game. The ultimate guide to gaming within the world of Sir Terry Pratchett's Discworld series can be yours! If your friendly local game shop doesn't have it on the shelf . . . perhaps they already sold out! Ask them to order it for you. And when you're looking for some place to share the excitement for this epic game, the GURPS forums are the best place to Disc-uss!